There is concern among diplomats and analysts in the region that the escalating violence could turn into a new intifada, or uprising. An Arab Israeli stabbed four people near a bus stop in northern Israel yesterday, as security forces confronted a spate of attacks against Israeli Jews, within the 1967 borders, and the West Bank. Four Israelis and 24 Palestinians, including eight children, have died in 12 days of bloodshed, fueled in part by Muslim anger over increasing Jewish access to the al-Aqsa mosque compound in Jerusalem and with Palestinians attacking Israelis with knives, rocks and, in at least one incident, guns. 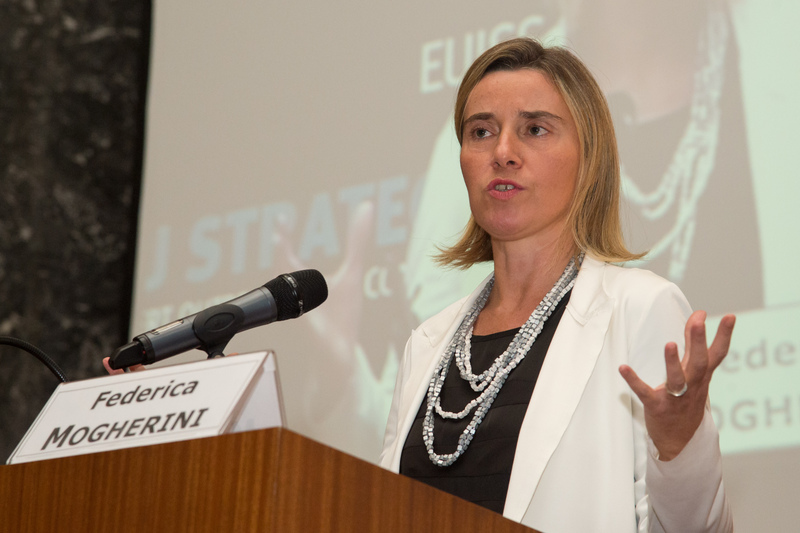 Mogherini held phone conversations with Netanyahu and Abbas and underlined the need to promote calm, encourage restraint and avoid actions which would fuel the tensions even further. She condemned acts of terror against civilians, and recalled in both conversations that the only way to tackle the violence and unrest is to quickly restart a credible political process. Violence has spread from Jerusalem and the Israeli-occupied West Bank to Israel’s interior and Hamas-ruled Gaza. Some Israeli Arabs have actively supported the protests, mainly by demonstrating in major Israeli-Arab population centers, and a general commercial strike in the Arab sector has been called for Tuesday. Israel’s cabinet unanimously approved imposing minimum four-year jail terms on Palestinian petrol bombers and rock throwers and issuing harsher fines as an emergency measure, Netanyahu said. “We are doing this as a temporary emergency measure so that we can examine the implementation, and if there will be a need, we will make the law even harsher,” he said in a statement. The attack near the town of Hadera in northern Israel occurred in the evening. Police said the Arab Israeli rammed a bus stop with his car, hitting one person, and he then got out and stabbed the same person and three others. Police said the attacker came from the Arab town of Umm el-Fahm, about a 15-minute drive from the scene. All four injured were taken to hospital and a police commander said a female soldier was in a serious state, while the others were lightly injured. Meanwhile, Palestinian medical officials said a 13-year-old boy was killed after being hit in the head by a plastic-coated metal bullet and 36 Palestinian protesters were injured in clashes in the West Bank on Sunday with Israeli troops who were also firing live rounds. Earlier, an Israeli air strike killed a pregnant Palestinian mother and her daughter in the Gaza Strip and police said they foiled an attempt by a woman to drive a car bomb into Jerusalem. But Palestinians disputed the account, saying an electrical fire in the vehicle was mistaken for an explosion. Palestinians regard the increasing visits made over the past year by Jewish groups and right-wing lawmakers to the al-Aqsa mosque compound in Jerusalem’s walled Old City as eroding traditional Muslim religious control there. The site is Islam’s third holiest and is also revered by Jews as the location of two destroyed biblical temples. Israel has said it has no intention of allowing any change to the status quo under which Jews are allowed to visit the site but non-Muslim prayer is banned. Tensions have also been stoked by Palestinian frustration over the failure to make progress in peace talks towards Palestinian statehood amid Israeli settlement-building in the West Bank. Those negotiations collapsed in 2014. Palestinians seek a state in the West Bank and Gaza, with East Jerusalem – which includes the Old City – as their capital. Israel captured all three areas in the 1967 war. It withdrew soldiers and settlers from Gaza in 2005.